Top: Hideaway Box Feeder $19.95 from Parrot Rescue Centre. Ceramic Pet Treat Jar $7.00 from Kmart. Treat-K-Bob Treat Dispensing Toy $7.90 from GP Australia. Middle: Burgon and Ball The Rabble Dog Tin $35.00 from Myer. 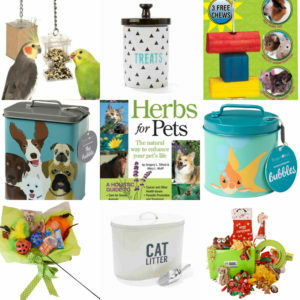 Herbs for Pets (book) $49.99 from Dymocks. Burgon and Ball Bubbles Fish Tin $22.00 from Myer. Bottom: Feline Fiesta Hamper $68.00 from Scamper Hampers. Cat Litter Storage Bin $15.00 from Kmart. Christmas Bow Wow Dog Hamper $75.00 from Scamper Hampers. Pawgie Treat Box – for $45 plus shipping, these boxes are packed with tasty treats to get pooches licking their lips and jumping for joy! Each box contains 5-6 quality Australian treats made from natural ingredients. These can be bags of baked biscuits, yoghurt drops, dried meats, dried vegetables, dried bones and other natural ingredient treats that pooches love! 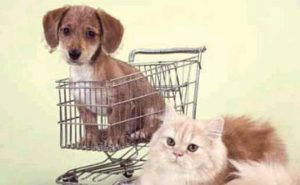 PetPacks Aus – this site has a vast selection of subscription boxes available, including a ‘mixed petscription’ box for those households that have both dogs and cats making up their family. The petscription boxes are quarterly subscription boxes that cost $90 per quarter (there are other payment options available as well). The double/mixed petscription box contains a selection of dog & cat toys, treats and grooming/lifestyle products.